I've been extremely blessed to be able to try out several Vitamin C Serums over the last couple months. This NEW to me Vitamin C Serum is totally different than any of the ones that I've tried! It's a whipped Vitamin C Serum. It's consistency is more like a lotion than a traditional vitamin C serum. They actually call it a Whipped Vitamin C Serum Moisturizer. 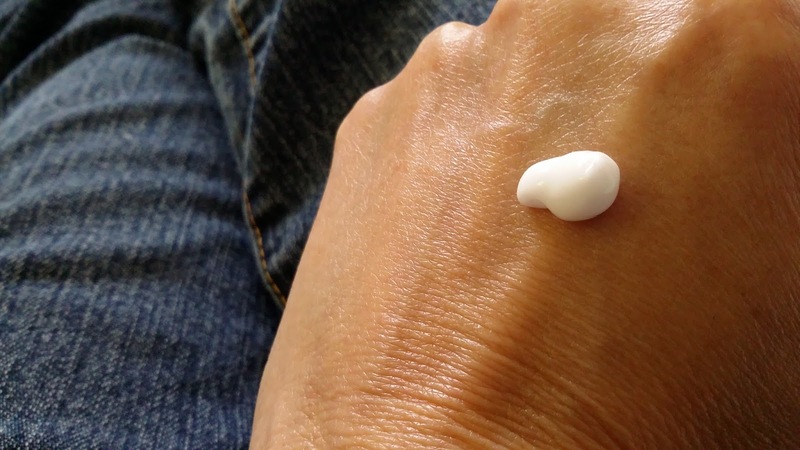 You can use it either before your moisturizer or in place of your moisturizer. I've just been using it in place of my moisturizer for now. It is a 3-in-1 product. It's a Vitamin C Serum, Moisturizer and gentle exfoliant all in one. It is made to be used by all skin types. There is a warning that you should start out slowly if you have sensitive skin. I did have a little redness the first couple days because it had been a couple weeks since I had used any kind of vitamin C serum. For me, the redness went away after those first couple days. I LOVE the consistency of this whipped serum. And it smells like oranges. Mmmmmmmm. . . . . . I honestly think I've found my new favorite Vitamin C Serum. It contains Vitamin C Ester, a form of vitamin C clinically tested to be 3X more effective than other forms. Contains a patented delivery system called QuSomes (TM), which ensures you receive the maximum ingredient benefits. The ingredients combine together to help boost collagen production, smooth the appearance of fine lines and wrinkles, hydrate and moisturize, heal and protect and brighten darkened spots. After all of the years that I spent in the sun, I can use all the help I can get with all of those issues. I especially have a lot of dark spots that could use a little fading. This Whipped Vitamin C Serum has helped even out my skin tone. With it's lotion-like moisturizing, it goes on perfectly under my makeup. 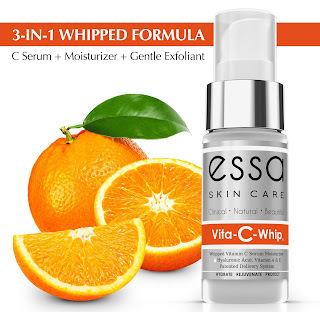 I am really enjoying using this Whipped Vitamin C Serum. It comes in a 1 oz. pump-top bottle. And guess what?!?! The pump works every time. Every. Time. You can find out more info at the ESSA website (Effective Skin Solutions for All). 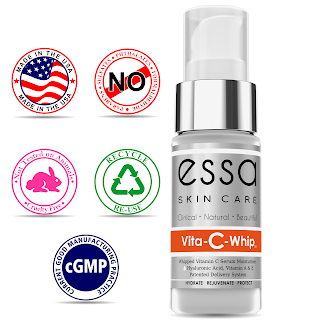 All ESSA skin care products come with a No-Hassle 30 day guarantee. Have you ever tried a Whipped version of a Vitamin C Serum before?